After the long weekend here in Canada, it has been a really long week for me. 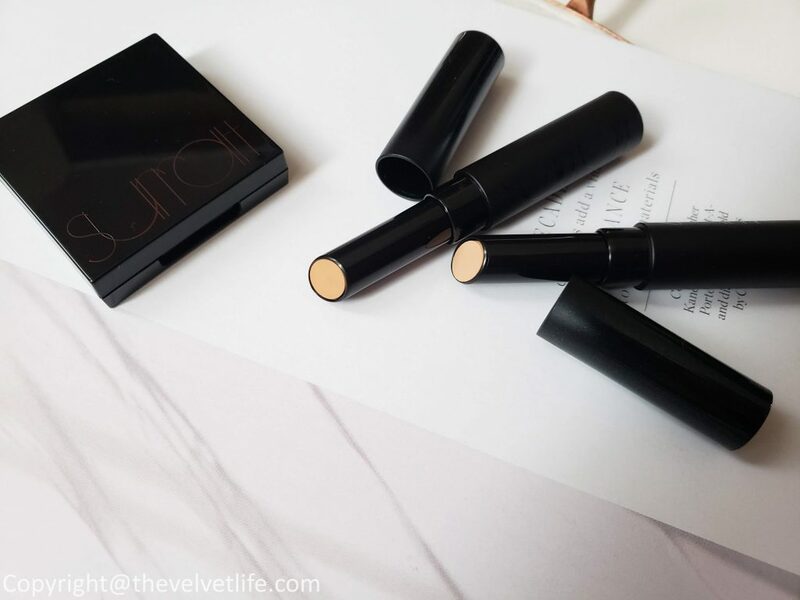 With a wedding, birthday party, guests, and work assignments, I have been looking forward to writing and sharing with you some amazing products from Surratt Beauty I have been testing since last few weeks. 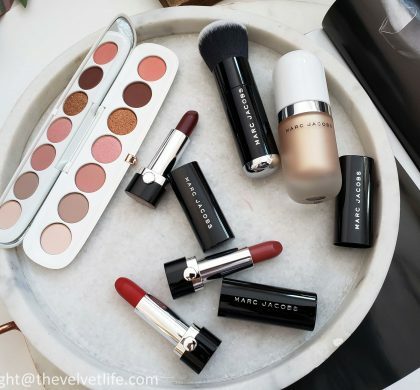 There is no doubt on the range of products and their quality, everything is exceptional which I have tried in the past, eyeshadows, and lipstick here and blush here. 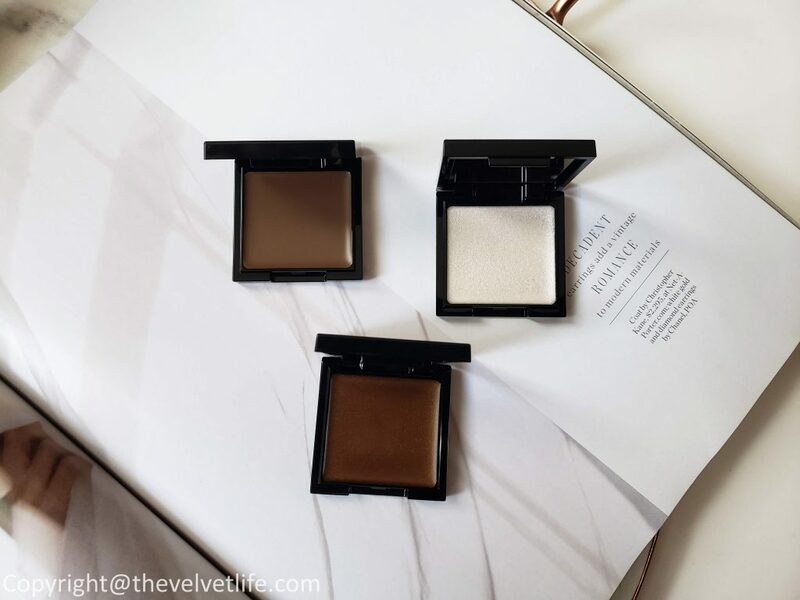 The new lid lacquer had been on my radar since it launched this year, as all the products are so versatile, exceptional in quality that you can use the product in different ways. 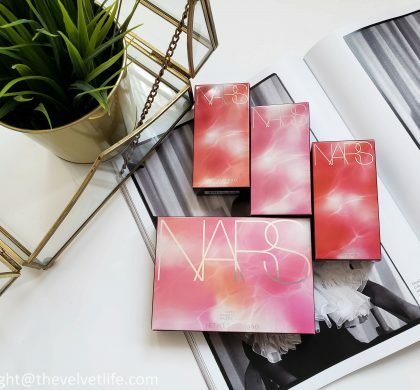 Same with the lid lacquers, they work great on the eyelids as well as lips and even as a highlighter or blush depending on the shade, there are no rules when it comes to these products. 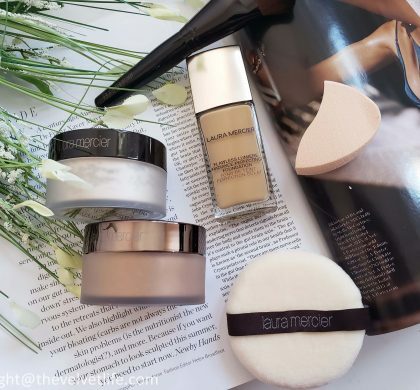 Along with the lid lacquer, there are more products I have been using from the brand which I have been really liking as shared further in this post. 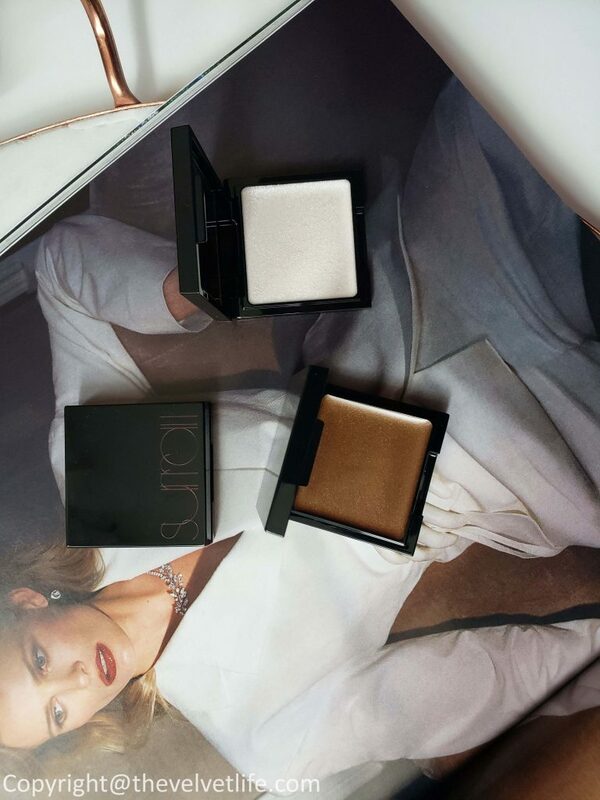 Surratt Beauty Lid Lacquer is described as a unique eye gloss which creates a lustrous glow for eyelids. It is inspired by a Japanese lacquer technique called urushi, this non-sticky formula features rich pigments suspended in a moisturizing, dewy base. The finish can be either sheer or vinyl-like and can have either a wash of color or a deep opacity. The high-gloss effect provides a modern alternative to traditional shadow. I have been using the lid lacquers almost every day and absolutely in love with them. They have the beautiful glossy finish which is always my favorite look on the eyes. The formula is very lightweight and very creamy, glides on really effortlessly. It gives a beautiful wash of color with the subtle yet glossy finish. They are non-sticky and perfect for one eyeshadow look or to layer with others. The range of shades is amazing, can work for every day as well as for editorial looks. The packaging of these lid lacquers is in a black lacquered mini compacts with red writing. As for the application, I highly recommend you start with the tiniest amount of product. The time I have been testing them, a little extra means it will crease. I want to stress by using a little to layer and then use more for the next layer. They can be used with fingers if you have firm control to be precise with the application, it can be used with the eyeshadow brushes for blending and even application while using fingers where needed, and it can be used with the foam applicators designed by Surratt Beauty specifically for these lid lacquers. As the name suggests, lacquer means you have to use it as a lacquer, a precise and thin layer and then build up as needed. 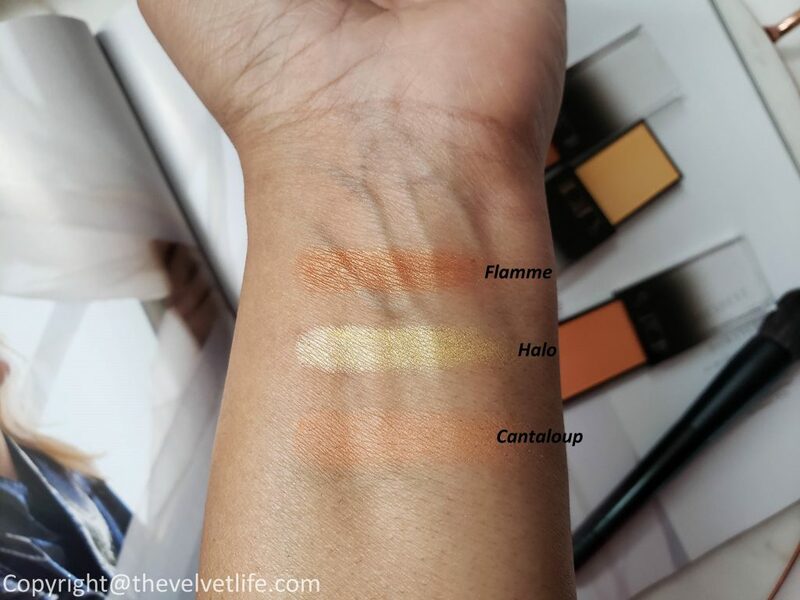 It stays on well on my eyelids for almost all day, a sheer wash of color or a little more on the lid, the glossy finish, just perfect of what I like for my everyday effortless natural look. I have the shades Komugi, Kogecha, and Kira Kira. 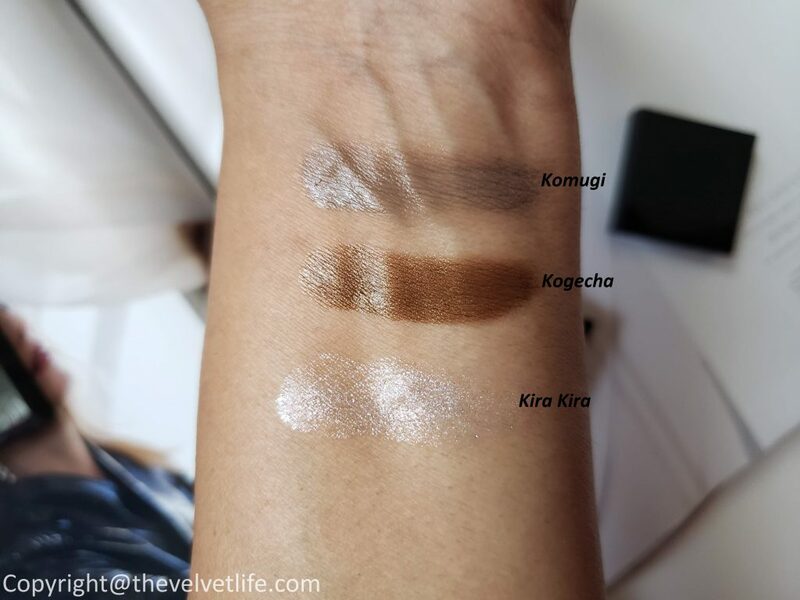 Komugi and Kogecha I can use for my daily routine and for work, Kira Kira is more of a highlighter for my skin tone or a beautiful fun and shiny eye color for evening or occasions. 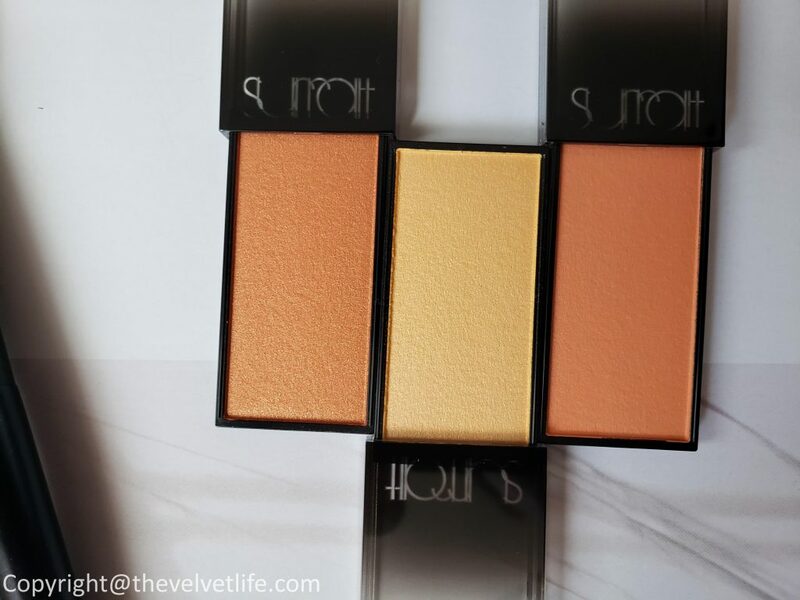 Surratt Beauty Artistique Blush is a long time favorite and I have reviewed them in the past in detail. The texture of the blush is very fine, they are pigmented and blend very easily. The product is made with an exclusive Japanese Slurry leaves method which makes the product very soft with a satin finish on the skin. The Japanese tradition of minimal elegance is what is implemented here too, the product in the pan might look dark or light but once applied it gives the most beautiful natural glow and color. I have been impressed with the texture and the results. A small amount is all that is needed and the results are amazing. The color payoff is good, the formula is cream-like, silky smooth and blends easily. The new shades I have been testing are Halo, Flamme, and Cantaloup. Surratt Beauty Surreal Skin Foundation Wand is described as a skin-perfecting foundation wand that’s a foundation and a brush in one. The Surreal Real Skin Foundation Wand leaves your skin looking flawless. Its innovative design makes application easy, and it instantly melts into skin, reducing the appearance of pores and fine lines. 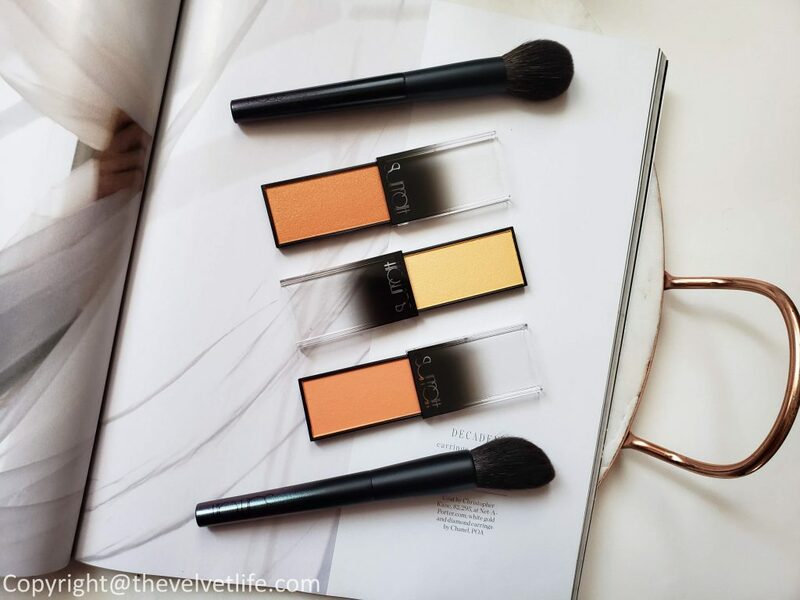 With a number of shades to choose from, it’s perfect for every skin tone. This foundation features a self-setting, oil-free formula that provides an invisible, medium-to-full coverage and a long-wearing finish. 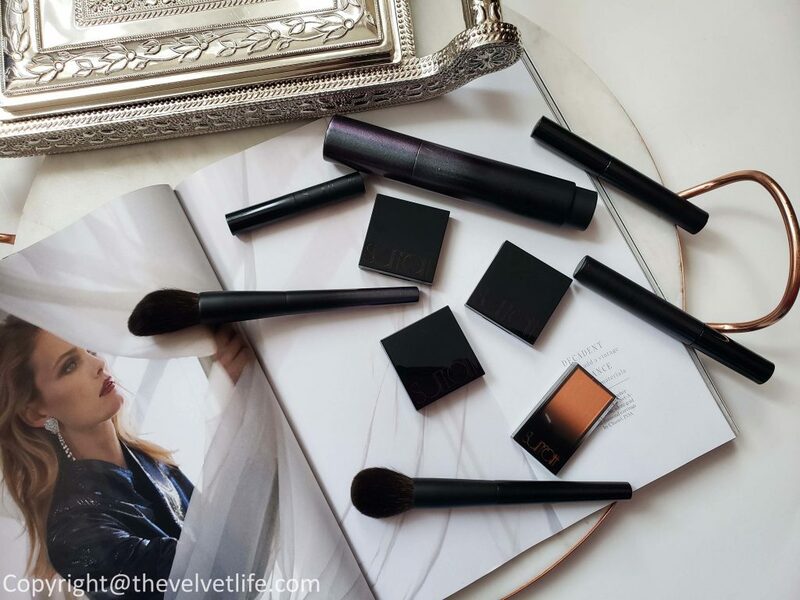 It dispenses foundation through a brush for effortless application and quick touch-ups. 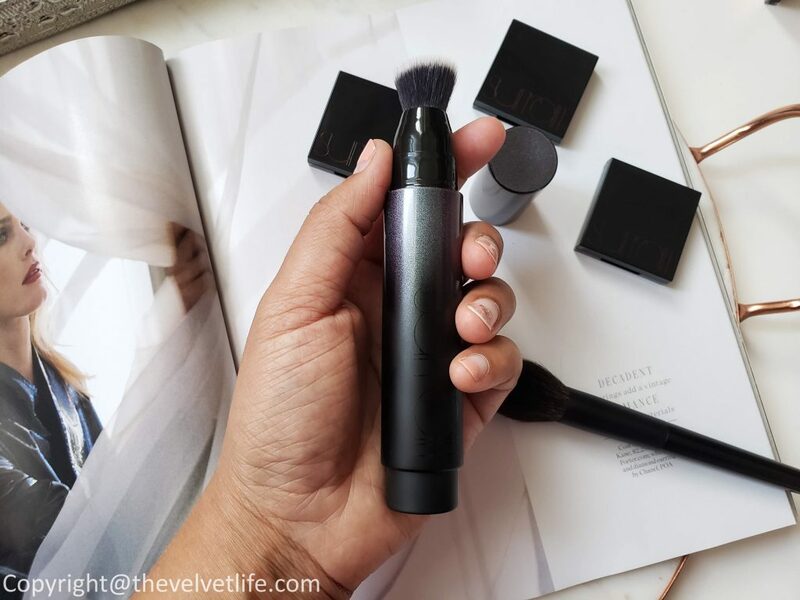 As you see the packaging, it is a very innovative product with brush and product in the same wand, and also the black sleek cylindrical tube looks amazing. 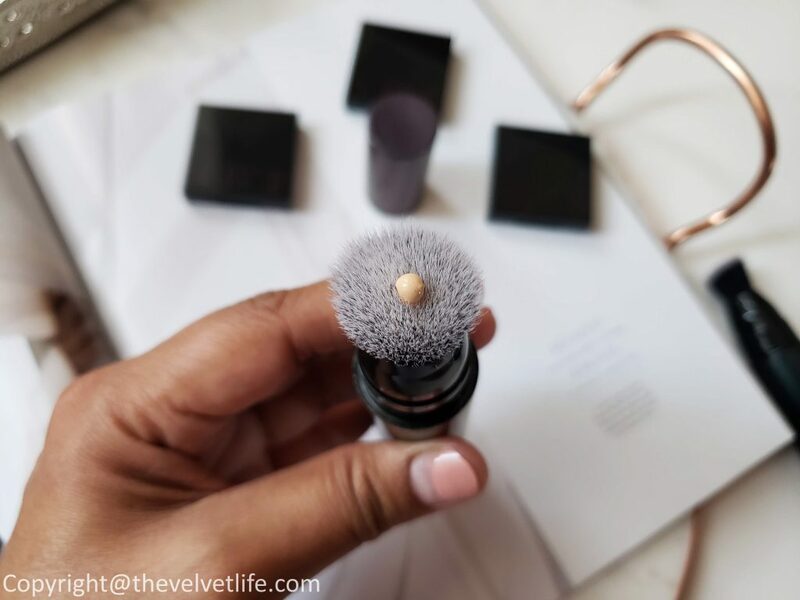 The foundation comes out from the brush side when you click from the opposite side of the wand, it takes a few clicks to get used to how much product dispenses depending on your need. The formula is creamy and blends beautifully into the skin. The finish is natural and glowy, which I am a fan of. The coverage is medium and covers most of my problem areas by building it up. 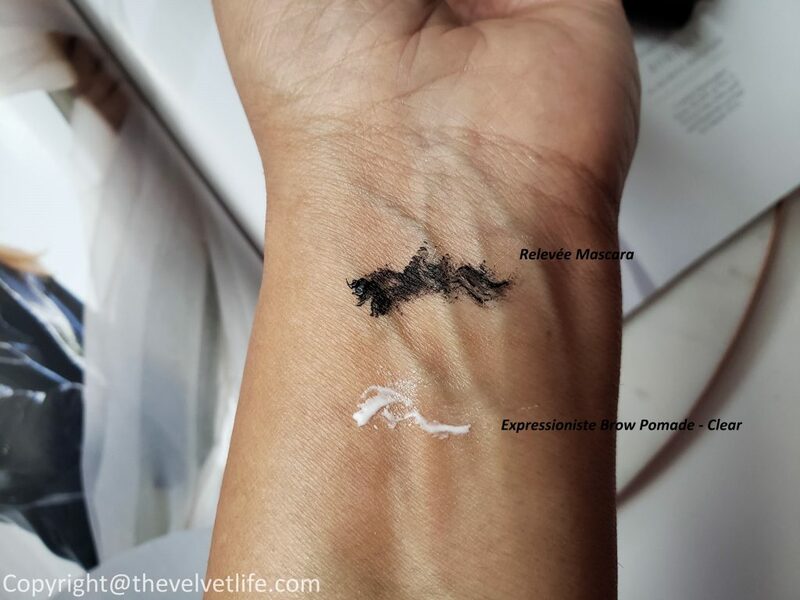 The staying power of the foundation is great, stays on well for over 8 hours on me and does not oxidize. I usually apply the product on the face in dots and then blend and buff with my other foundation brush or my beauty blender. I am really impressed by how natural and radiant my face looks with this foundation. It does not cake, or settles into my problem areas or even the dry areas. I have shades 4 and 7 which both work well for me, shade 7 for the whole face and shade 4 as a highlighter or concealer. Overall, the foundation is going to be on my favorite’s list. Surrat Beauty Surreal Skin Concealer is described as a long-lasting concealer that erases dark circles and offers surreal coverage. This creamy concealer stick helps vanish under-eye circles, dark spots, and discoloration. The enduring, opaque formula becomes one with skin and outlasts hot lights and long days. This is a beautiful product which is creamy and very lightweight. It blends seamlessly into the skin while concealing the problem area. It does not make the area cakey or dry. I use it to cover my problem areas on the face including the dark spots left by my acne, the pigmentation and also works nicely under the eyes to brighten up the area. The staying power is nice, and I do set this concealer with a loose powder. The bullet stick is easy to dab on and then smooth with my finger or a brush. It does not settle into the problem areas or lines. The finish looks natural. It is one of the best concealers I have used after my Cle de Peau Beaute and Laura Mercier Concealers. 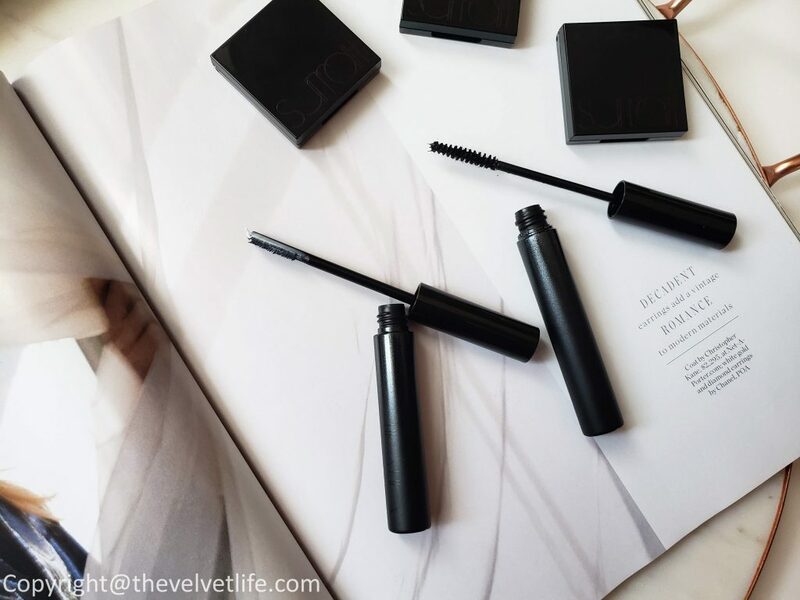 Surratt Beauty Relevée Mascara is described as black lengthening and defining mascara for creating impossibly long, arched lashes. 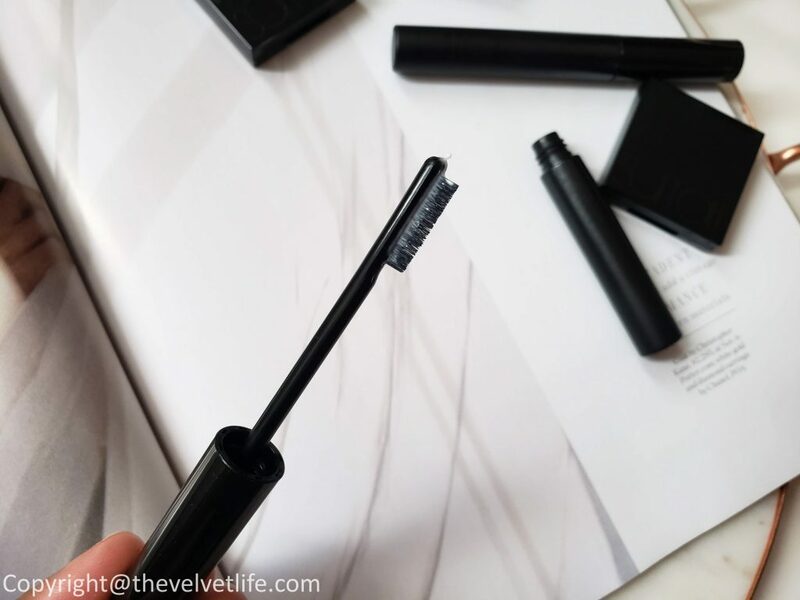 Its slim, angled brush lifts, arches, and gracefully fans out lashes, while the humidity-proof Japanese tubing formula hyperextends them with microfibers. The formula shrink-wraps around lashes, preventing smudges or fallout. 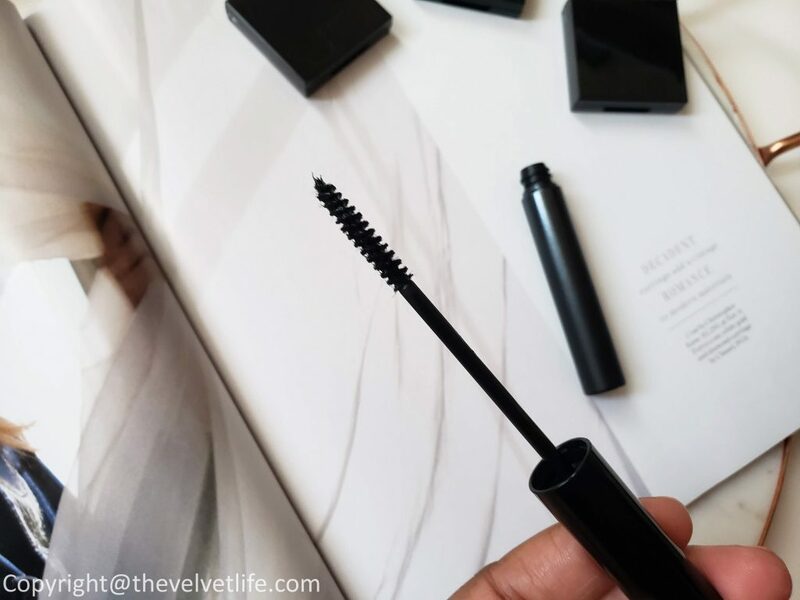 It is a really nice mascara for giving some length and volume to the lashes, the gel-like formula does not flakes or clump. It stays on well all day, the lashes look long and thick. It is super pigmented, the richest black I’ve ever seen. Surratt Beauty Expressioniste Brow Pomade is described as a clear, flexible wax formula works to lift, shape and hold each and every brow hair in place in one sweep. The comb-like brush grooms hairs with ease in a colorless, undetectable finish. If you see in the finish, you might think is it glue like and waxy white product but it dries clear, looks so natural, without any stiffness on the brows. It is undetectable on the brows and gives beautiful brows on sleek. The applicator takes few turns to get hold off but once you get used to it, it is going to be a favorite. It does not clump the hairs together or make them feel dry and crispy, Instead it fluffier, fuller, smooth and keep your brows in place all day long.